We know, we know, your Instagram feed is already killer — a bonanza of decadent meals, brilliant sunsets and perfectly poised centerpieces. But summer brings with it a whole new slew of Insta challenges and you’ll need some accessories to become a photo ninja. Here we have everything you’ll need to craft the perfect beach setup for your personal gallery. “Roundies,” those funky round towels done up in cool patterns are taking beach setups to a whole new level of boho-induced loveliness. The most coveted beach towel of any self-respecting Tulum resort goer, these thick woven blanket-style towels are multi-functional too, serving as beach blankets, wraps and of course – fantastic photo subjects. 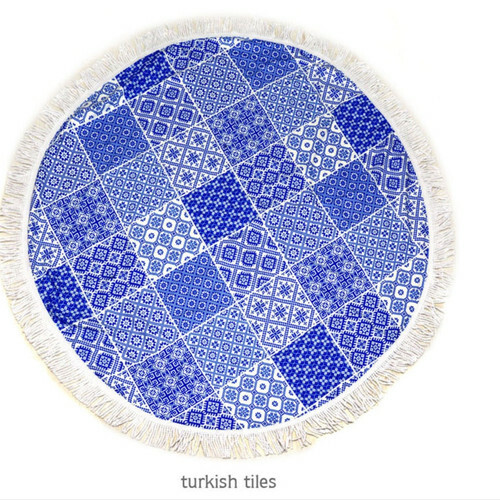 We are loving Miami-based Turkish towel company BASK’s printed roundie in this Turkish tiles-inspired blue and white pattern. For something a little more nautical there’s this Laura Ashley Ahoy picnic rug with a nifty carrying strap. It will add a nice preppy backdrop to your pics. And if a traditional terrycloth towel is more your thing, go for The Original Miami Beach Towel Co.’s green leaf towel in a thick luxurious weave. But sometimes you just have to give in to what the internet wants and lay on that pink sprinkle doughnut towel. Because, doughnuts. And bikinis. Your bag should figure prominently in the shot, of course. We’re opting for this Fairview tote from Parkland because its flamingo print is so Miami. The fully-lined interior and multiple organizational pockets will keep all your beachy goods in place. For a more refined look go for this reversible tote from Miami-based designer Miansai. Made from durable navy and off-white canvas with reinforced leather trim, the bag features an exterior zip pocket and the brand’s signature rope handles. Handsome and minimalist, it can go from the beach to brunch and still house all your essentials. For a little cheeky fun, go with Pinkly Perfect’s Cape Cod Pouch. Made in the USA, this custom-printed bag will keep your cell and sunnies sand-free while you frolic in the waves. Isola’s wet bathing suit bag is a plush terry monogrammed bag lined for durable use – perfect for your wet bathing suits after a day at the beach or as a pouch to hold sun tan lotions.